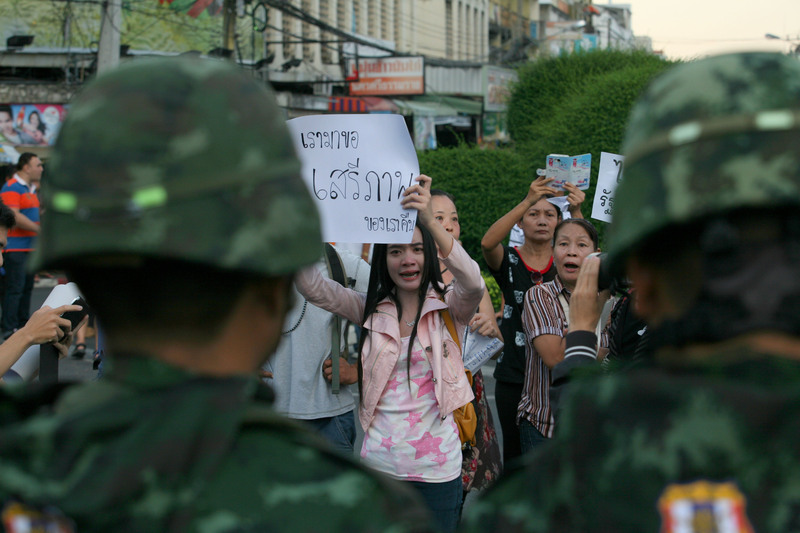 On May 22, 2014, the Thai army seized power in a coup that unseated the democratically elected government. Since then there have been sporadic protests against the coup, mostly by flash mobs that appear and then break up when soldiers arrive. The military has detained or summoned hundreds of politicians, academics, activists and journalists from both sides of the political spectrum. Most were released after seven days detention but the junta has repeatedly warned against any form of criticism of its rule, even posting rewards of 500 baht ($15) on pictures of persons showing dissent to the coup. To date, the opposition Red Shirts have stayed quiet. Some leaders even announced that they would cease political activities and cooperate with the army. At the same time the Junta is trying its best to win the hearts and minds of the people by hosting ‘’return happiness to the people’’ concerts with free food and live music. On the streets the few remaining tourists are eager to have their photo taken with heavily geared soldiers stationed on major roads and public places. A look into daily life under the junta. A man offering free hugs to tourists, hugging soldiers standing guard in the city center in Chiang Mai Thailand. 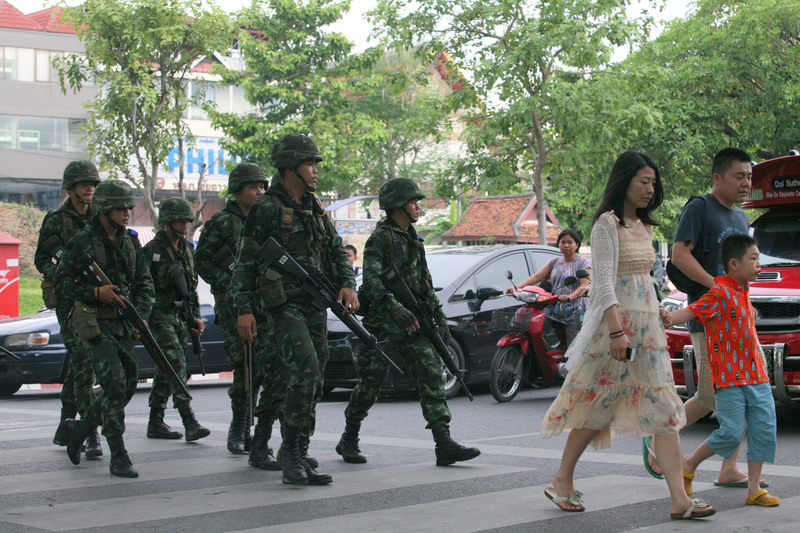 Soldiers and a Thai family crossing the road near the Chang Puak gate in Chiang Mai, Thailand. Since the coup soldiers have been stationed on major roads and in public places. A English translator making an announcement for tourists. Despite the end of the nationwide curfew, a martial law is still in place. 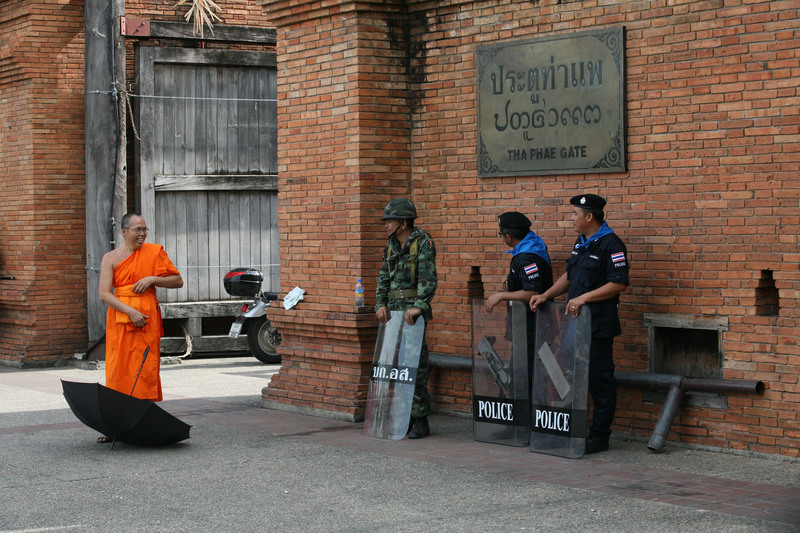 A monk and soldiers in friendly conversation in downtown Chiang Mai, Thailand. Girls dancing at a army-sponsored concert in downtown Chiang Mai, Thailand. In several places in Thailand the army has launched a ''return happiness to the people campaign'' with free food and live music. Anti-riot forces of The Royal Thai Army during a drill. Since the coup on May 22, 2014 the Thai army has regularly organized drills in public places as a show of strength and unity. Students on the streets of Chiang Mai during the night after the Thai army announced an end to the nationwide curfew on June 13, 2014. 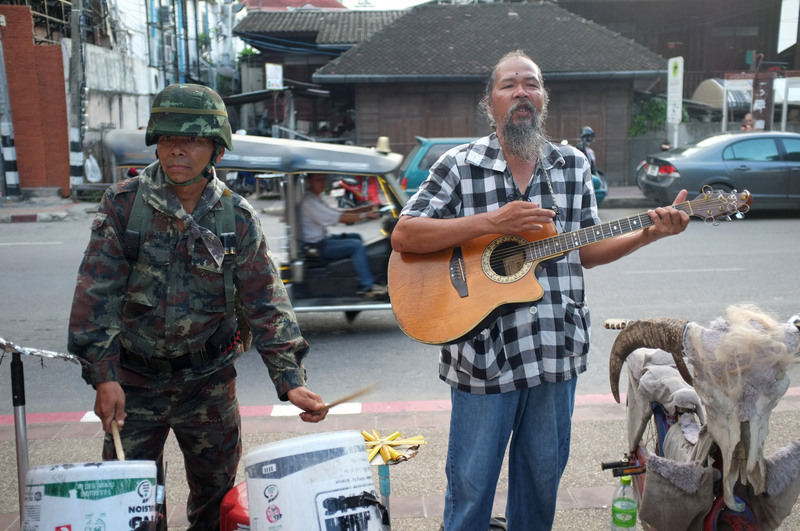 A Thai soldier and a street musician in downtown Chiang Mai, Thailand. 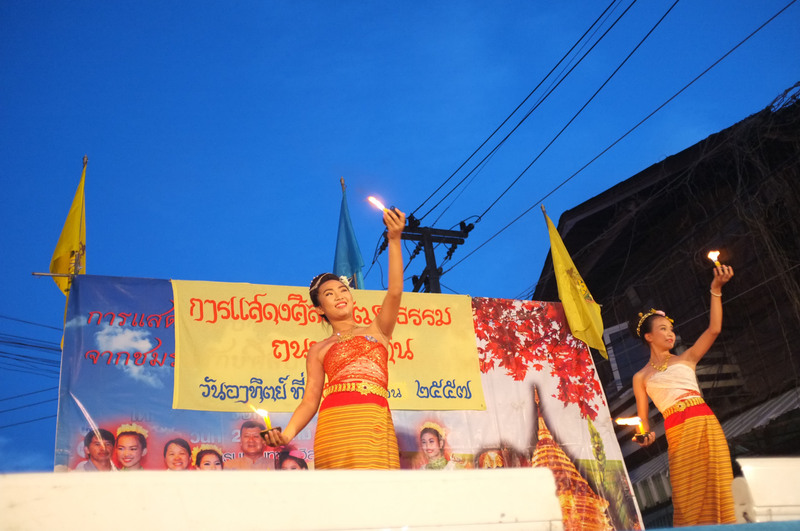 Chiang Mai, the heartland of the Red Shirts, or Thaksin-supporters, has remained surprisingly calm since the coup. Many feared that Chiang Mai would become the center of resistance, but except for a few independent rallies by locals, the Red Shirt movement has stayed quiet so far. 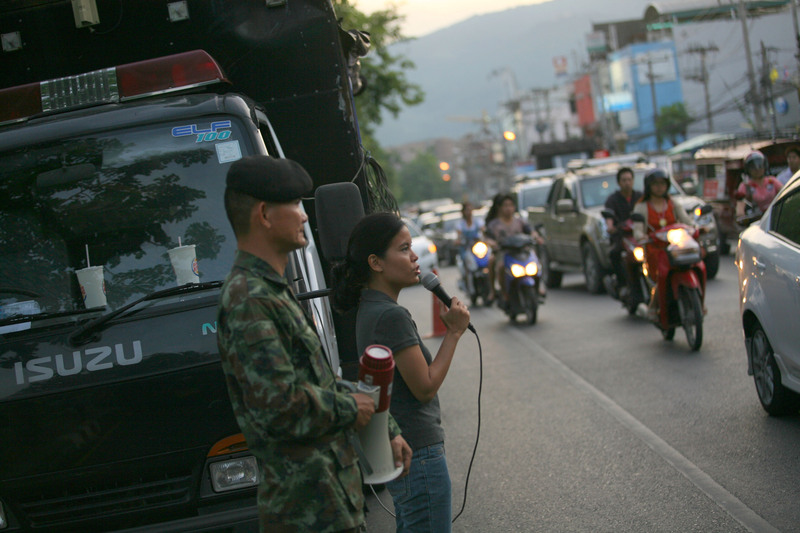 One of the few rallies against the military coup that took place on May 22, 2014 near the Chang Puak Gate in Chiang Mai, Thailand. 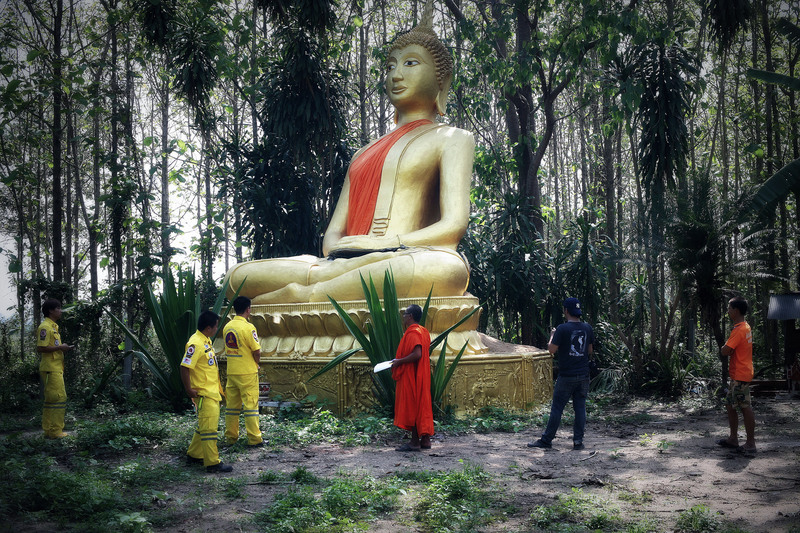 A Buddha statue deep in the forests of Northern Thailand split in half by a earthquake registering 6.3 on the Richter scale that struck Thailand's Northern province Chiang Rai on May 5, 2014. The earthquake was the strongest ever recorded in Thailand. Locals believed it was a bad omen for the nation because Prime Minister Yingluck Shinawatra's trial verdict was to be announced the same week. 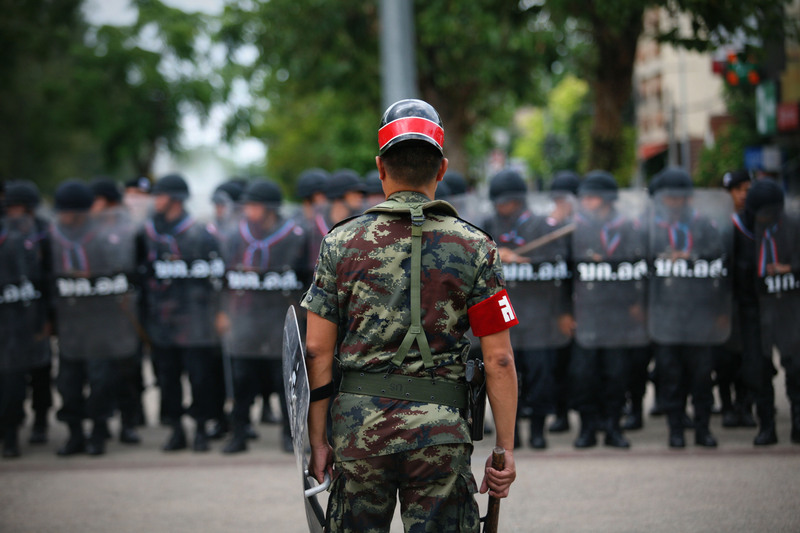 Amid calls for a separate Northern state by hardline Red Shirt leaders and the Sor Por Por Lanna group, many feared that the outcome could lead the country to civil war.